Does your pup always whine for treats after doing a few tricks? Do they tend to ask for seconds during dinner time? You’re not alone. Dog owners have a hard time resisting those puppy-dog-eyes, and that can lead to overfeeding at meal and treat times. More dogs are gaining too much weight these days, and it’s not just a “thicc and floofy” trend that you can dismiss as a cute new look. In the U.S., almost 56 percent of dogs are considered overweight or obese. According to a report from the Association of Pet Obesity Prevention, this trend isn’t going away anytime soon. What’s even more alarming is that this may actually not just be due to how much dogs eat. Veterinarian and association founder Ernie Ward confirmed that factors like genetics, bacteria, a sedentary lifestyle, and even hormones can all contribute to concerning numbers when your dogs steps on the scale. Like with people, a change in diet alone cannot take off the pounds in a healthy way–although, it is a great start. It’s important to explore other kinds of diets that provide more nutrients with fewer calories. Here’s a common vet tip: get rid of the treats, first. “Most of the treats that are on the market today are so full of fat and sugar, and that makes your dog crave them even more,” said Ward. Before changing your pet’s diet, it’s also good to consult your trusted vet or nutritionist about this. Don’t be afraid to ask what you can do to help your pet slim down to a healthier size. Ask for dietary advice, because your vet or nutritionist may know the right combination of food and nutrients that will keep your pet healthy and provide their daily vitamin and dietary needs. 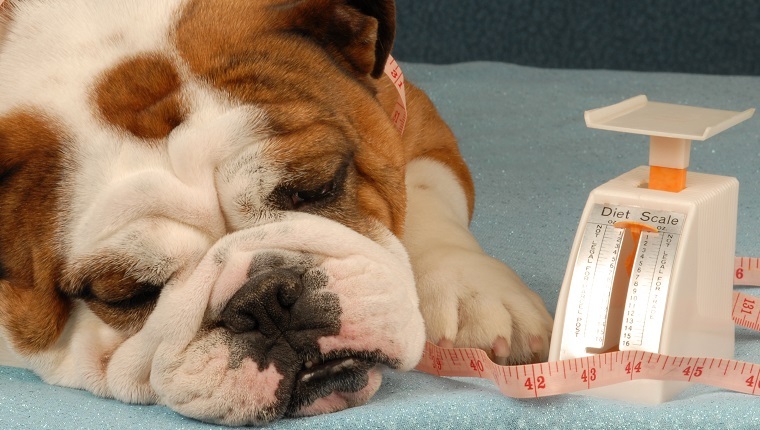 Your vet can also tell you about factors outside of your dog’s diet that may affect weight. They can make exercise recommendations, advise changes in lifestyle, or test for medical conditions that might present challenges to weight loss. The issue of weight doesn’t stop with your dog looking a little more round. With heavy weight on their legs, dogs are more at-risk for osteoarthritis due to obesity. Excess fat and weight can put a lot of pressure on the joints and increase the progression of arthritis. More dogs are developing this issue because of the rising trend in obesity. Obese dogs suffer from poor physical health, and there doesn’t seem to be an end in sight. This easily snowballs pet owners’ problems. As more canines present with arthritis, more of these dogs need drugs to maintain arthritis. More often than not, taking medication for arthritis can cause side effects that might lead to serious issues, too. Prevention is the best medicine. Take steps to control your dog’s weight. Stick to an appropriate diet and exercise routine, and hold back on those treats. Resist the puppy-dog-eyes! Your dog will be happier and healthier for it. Is your dog on the heavier side? What are you doing about it to make sure they get back on the healthy track? Share your stories with us in the comments below!